Ian Donald George MacDougall was born in Sydney on 23 February 1938 and joined the Royal Australian Naval College as a 15-year old cadet midshipman in January 1954. He graduated the following year and during 1956-57 he undertook professional training afloat, and at the Britannia Royal Naval College, Dartmouth, United Kingdom. Upon graduation he was awarded the Queen's Telescope for leadership. From 1958-1963 he served as a supply officer in several ships and establishments including HMA Ships Anzac, Albatross, Swan, Vampire and Melbourne. In 1960 he was promoted lieutenant and obtained his Bridge Watch Keeping Certificate (in HMAS Vampire's first commission) and subsequently, in 1963, transferred to the Submarine Arm as a seaman officer. Ian MacDougall's initial submarine experience was in the United Kingdom serving in HMS Alaric and HMS Otus.He was promoted lieutenant commander in 1968 and appointed as executive officer of HMAS Oxley then under construction at the ship builder's in Scotland. From 1969-71 he commanded HMS Otter whilst on exchange with the Royal Navy; before returning to Australia and commanding HMAS Onslow from 1971-73. The submarine conducted a Southeast Asian deployment during this time as part of the ANZUK Force based in Singapore. 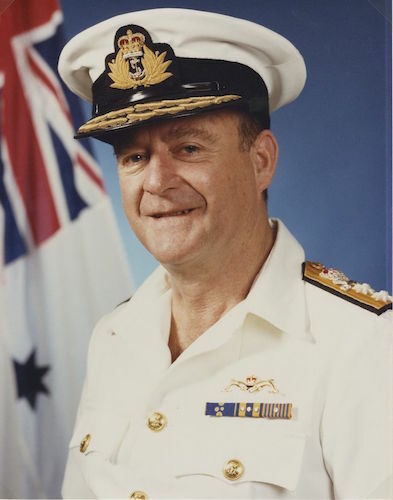 MacDougall was promoted commander in 1973 and the following year was appointed Officer in Charge of the Submarine Command Team Trainer, based at HMAS Watson until 1976. During this period the Trainer was accepted into service. For 18 months from 1977-78 he served in Canberra as Deputy Director of Naval Officers' Postings. During the period 1978-79 he was executive officer and briefly commanding officer of the guided missile destroyer HMAS Hobart. The ship participated in Exercise RIMPAC in Hawaiian Exercise Areas and rescued an injured scientist from Macquarie Island. This entailed the construction, whilst on passage, of a temporary helicopter platform on the ship's stern. He was promoted captain in 1979 and during 1980-82 MacDougall commanded the fleet replenishment ship HMAS Supply. A major activity for the ship was an Indian Ocean deployment in response to the Soviet Union's invasion and occupation of Afghanistan. From 1982-84 he served in Canberra as Director of Submarine Policy, during which time he was involved with the initial policy development for the Collins Class Submarine Project. During 1985 MacDougall commanded the Australian Submarine Squadron based in HMAS Platypus at Neutral Bay, Sydney. MacDougall was promoted commodore in 1986 and appointed Director General Joint Operations and Plans for the Australian Defence Force. In early 1988 he conducted a review of the roles and functions of the Naval Support Command as part of the RAN's devolution program. He was promoted rear admiral in January 1989 and appointed as Maritime Commander Australia. One of the highlights of his time in command of the fleet was attendance at Gallipoli during the 75th Anniversary of the Anzac landings in 1915. Another key event was Exercise KANGAROO 89, Australia’s largest ever peace time operation exercise. In July 1990 he took up the position of Deputy Chief of Naval Staff. He is a graduate of the US Naval War College (1980) and an occasional external student at the University of New England, reading history. He was appointed an Officer in the Military Division of the Order of Australia (AO) in the Australia Day Honours List in 1991. Vice Admiral MacDougall was appointed Chief of Naval Staff on 8 March 1991. Vice Admiral Ian MacDougall was made a Companion of the Order of Australia (AC) in the 1993 Queen's Birthday Honours List, before retiring from the Royal Australian Navy in March 1994. Vice Admiral MacDougall went on to become the Commissioner of the New South Wales Fire Brigade and in 2000 he was awarded the Australian Fire Service Medal.